The carnival parade takes place as planned today! On 25.01. at 18.00 we will meet in village center for our winter hike 2019. BGV Ehrabocha Kerwasburschen invites all members of our association to the general annual meeting 2018 on 01.02.2019 at 19.00 in guesthouse Sponsel. BGV Ehrabocha Kerwasburschen wishes a merry Christmas and happy new year to all members, friends and supporters of our association! The dates 2019 are online now! Due to the small amount of participants, the club trip to Abtswind on 6th October has been cancelled. Please subscribe until 20.09. at latest if you would like to join the next club trip to Abtswind on 06.10.2018. On 11th August, the annual club party with club championships takes place at 16.00 at THW drill grounds. Please inform our chairman Michael Pirmer if you will join the party so that we can plan he food. On 28th Match at 20.00 we will have our regulat Easter table at 20.00 in guesthouse Sponsel! The dates 2018 are now online. On 3.2.2018 at 17:00 we meet in village center for winter hike 2018. BGV Ehrabocha Kerwasburschen invites all members of our association to the general annual meeting 2018 on 19.01.2018 at 19.00 in guesthouse Sponsel. On 2nd October we will again celebrate our annual club party with club championships. If you would like to attend, please inform us via our contact form until Friday 29.10. at latest! In the gallery, 91 pictures from human kicker tournament 2017 have been uploaded. On 19th July, next meeting of Parish Fair Boys is taking place at 18.00 in Dennerschwarz. On 20th June at 18.00 first meeting of parish fair boys is taking place in BGV club barn! From 29.4. to 1.5. we have the possibility to join the trip to Hassel to celebrate 30 years partnership. In the German new section, you can find pictures and links to newspaper articles about general annual meeting 2017. The dates and events 2017 are now online. On 17.02. winter hike 2017 is taking place at 18.30. On Friday 3rd February at 19.00 our general annual meeting 2017 will take place in guesthouse Sponsel. All members and friends of our association are kindly invited to this general annual meeting. On 21.12. at 8 p.m. the christmas table of BGV Ehrabocha Kerwasburschen is taking place in guesthouse Sponsel. BGV Ehrabocha Kerwasburschen invites groups to participate our Carnival Parade 2017 on 27th February. Please use the contact form on this homepage to subscribe before 31st January. On 2.10. at 17.00 the annual club party with club championships will take place. Please subscribe via email until 30.9. at latest. You can use the contact form on this homepage. Meeting Place for our Club Trip on 13.8. is 13:15 at village center. On Wednesday 3rd August at 7 pm at guesthouse zur Sonne the parish fair boys have their next meeting. You can from now on contact Andy Schnitzerlein to signon for our club trip to Straubing on 13th August. First meeting of Parish Fair Boys 2016 takes place on 29.6. at 19.00 at guesthouse Sponsel. Please use the contact form on this homepage to send us your proposals for the next club trips until end of May at latest. You can use our Contact form to subsribe for the tournament. Please send us your team name, and the email address and phone number of your contact person. On 22nd January at 18.30 we meet in village center for winter hiking 2016. On Friday 15th January at 19.00 our general annual meeting 2016 will take place in guesthouse zur Sonne. On 16.12. at 8 p.m. the christmas table of BGV Ehrabocha Kerwasburschen is taking place in guesthouse zur Sonne. Info: the annual club party with club championships has been postponed to 7th November. The next meeting of Parish Fair Boys is taking place on 6th August at 19.00 at guesthouse Dennerschwarz. In the gallery, 67 pictures of human ticker tournament 2015 are now online. From now on you can subsribe for the club trip to Abtswind on 17.10.2015. You can use our Contact form to subsribe for the Bierathlon on 16th May. Please send us your name, address, email address and phone number. There are still 18 free seats for the Club Trip to Munich on 25th April. Contact person is Andy Schnitzerlein. 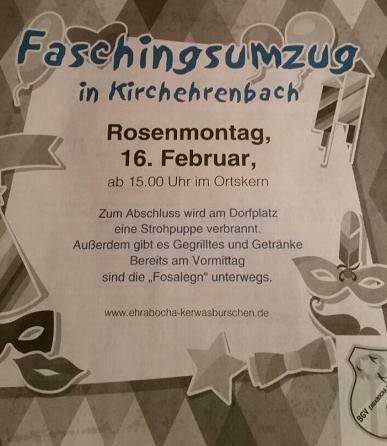 BGV Ehrabocha Kerwasburschen would like to thank Frischemarkt Lochner and Moni Kraus for their support during carnival parade 2015. From today on you can subscribe for the Club Trip to Munich on 25th April. On Friday 23rd January at 19.30 our general annual meeting 2015 will take place in guesthouse Sponsel. Because of bad weather and bad condition of the slide track, the slide race has been cancelled! On 17.12. at 8 p.m. the christmas table of BGV Ehrabocha Kerwasburschen is taking place in guesthouse zur Sonne. The BGV dates 2015 are now online in the menu item Dates. Because of the rainy weather, today´s club party will take place in our club barn instead of TWH drill ground! On Saturday 23.08.2014 at 4 pm the annual club party with club championships is taking place at THW drill ground. In the German news area you can find the latest details about our club trip on 09.08. Please note: the meeting plave has changed to TRAIN STATION! We meet at 11:30 and will leave at 12 am. On Wednesday 06th August the parish fair boys meet at 7 pm at Dennerschwarz to discuss the upcomung parish fair! In the gallery you can now find 112 pictures of Beach Volleyball Tournament 2014. BGV Ehrabocha Kerwasburschen thanks all sponsors of Bierathlon 2014! Since yesterday the planning for the Beach Volleyball Tournament on 12.7. is online. Please use the contact form of this homepage to subsribe into the plan. Please check the German translation of this site in order to see all details of the club trip 2014. In the news you can now find the duty schedule for Walberlafest. On 29th March 2014, internet competition 2014 is started. Information can be found in the menu item Competition. The standing orders of the association have been updates based on a decision by managing board from 05.02.2014. In addition the date of the Bierathlon has been changed from 17th May to 31st May 2014. The new managing board that has been elected during general annual meeting on 24.01.2014 is now online: Association - Managing Board! On Friday 17.1. we meet at 6 pm in the village center for the winter hike to Pretzfeld. On Friday 24th January at 19.00 our general annual meeting 2014 will take place in guesthouse zur Sonne. In the internal area of the gallery, 379 pictures of Parish Fair 2013 are now online! The BGV dates and events for 2014 are now online in the menu dates. On 21.9. we are going to a wine trip to Escherndorf. We meet at 3.30 pm in the village center. Currently (08.09.2013) there are still 10 seats free - if you are interested, please contact Andy Schnitzerlein! There are more than 200 new pictures online in the internal gallery. The Parish Fair dates 2013 are now available on this homepage in the menu item Dates. The detailed schedulefor the active Parish Fair Boys can be found HERE. On 17th August at 4 p.m. the annual club party is taking place at THW training grounds. Between 4 and 5 p.m., we will also have another club championship. All club members are kindly invited to that party! At the sports festival of TSV Kirchehrenbach, BGV teams have won both the card tournament (Schafkopf) and the football tournament! On 13th July there will be a Morning Pint with traditional tournament in our club barn. Please subsribe your 4-person-team by 1st July using the contact form on this homepage. The first parish fair boys meeting takes place on Wednesday, 19th June at 7 pm in guesthouse zur Sonne (Dennerschwarz). BGV Ehrabocha Kerwasburschen thanks all sponsors of Bierathlon 2013! You can use our Contact form to subsribe for the Bierathlon on 27th April. In the public gallery 84 pictures of the Carnival parade 2013 are now online. BGV Ehrabocha Kerwasburschen invites all members and friends of our association to our General Annual Meeting on 01.02.2013 at 07.00 p.m. in guesthouse Sponsel. On 19.12. at 8 p.m. the christmas table of BGV Ehrabocha Kerwasburschen is taking place in guesthouse zur Sonne. In the internal area of the gallery you can now find more than 300 pictures from parish fair 2012. Our Parish Fair 2012 starts on Thursday 23rd August. On Satorday 6th October, our association is going to the festival Cannstatter Wasen in Stuttgart. Please contact Andy Schnitzerlein for more information or subscription. On Saturday 18th August 2012 we have our annual club party with club championships. Kirchehrenbach has signed up for the Bayern 3 Village Festival 2012. On Thursday 2nd August, the village needs your support when the Bayern 3 TV team will be in Kirchehrenbach at 1 p.m.! On 8th August at 7 p.m. the next meeting of Parish Fair Boys is taking place in guesthouse Zur Sonne. Please order yout t-shirts until 3rd August at the latest! Contact person is Daniel Harrer! Thanks to all supporters during the Beach Volleyball Tournament 2012. In the gallery you can now find some pictures. The results can be found under News in German language. On Wednesday, 13th June at 7 p.m. the first parish fair meeting 2012 is taking place in guesthouse Sponsel. We kindly ask all active parish fair boys to participate this meeting! Under Dienstplan_BeachVolleyball.pdf you can find the service plan for the Beach Volleyball Tournament on 14th July 2012. Please contact Thomas Gengler in order to reserve a fitting time slot. On 22.4. the competition 2012 is starting with new questions every two weeks. You can win attractive prizes. On Saturday the 24th March at 9 a.m. there is a work service in the BGV barn next to the church in order to prepare the swallows. On Friday 20th January at 19.00 our general annual meeting 2012 will take place in guesthouse zur Sonne. All members and friends of our association are kindly invited to this general annual meeting. We would like to thank all members of our association for the good support during the past year and would like to invite all of you to our Christmas regular table on 14.12. at 20.00 in the guesthouse zur Sonne (Dennerschwarz). We wish all of you a merry Christmas and a happy new year! Our inventory supervisor Manuel Hufhanskortz Gebhardt is planning a work service on 18. and 19. November in the new club barn next to the church. Please inform Manuel if you have time to attend one of these work services. 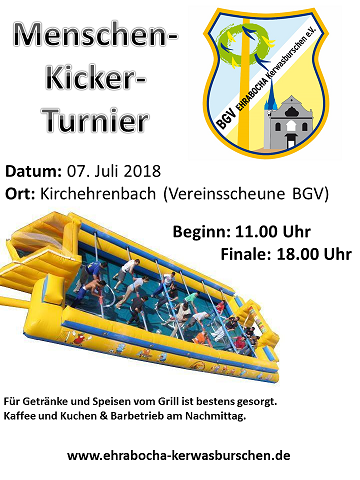 BGV Ehrabocha Kerwasburschen has won the parish fair tournament in Walkersbrunn! The first 270 pictures of parish fair 2011 are now online in the internal gallery. In the internal galery, the pictures of the Club Championships 2011 are online now! Next Saturday (20. August) beginning at 16.00, the annual party with our championships will take place. Pictures from Beach Volleyball Tournament are online now in the gallery! The competition 2011 has been started today! The program and the first-round groups for the BGV beach volleyball tournament are defined now. We still need many helpers for the touranement. It would be great if additional helpers could inform us via email using our contact form on this homepage if you are willing to help us during that tournament! Under http://www.ehrabocha-kerwasburschen.de/Dienstplan_BeachVolleyball2011.pdf you can find the plan for the beach volleyball support 2011. Please write us an email using the contact form on this homepage in order to subscribe into the supporter table. In the gallery, the pictures of the carnival parade 2011 and the Fosalegn has been uploaded. In the internal area, additional pictures can be viewed. 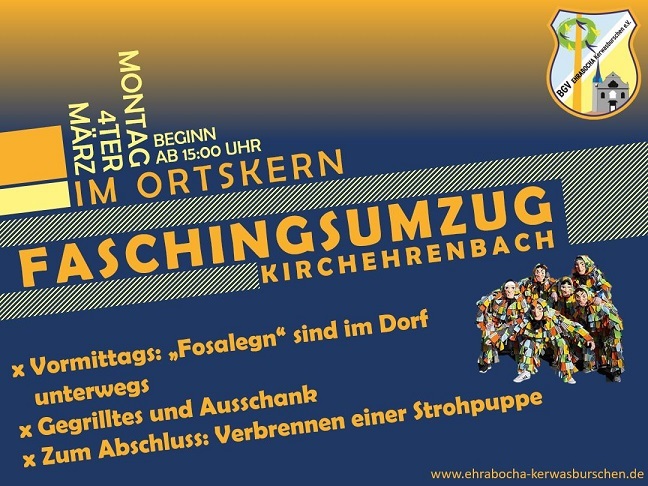 7th March is carneval day for BGV Ehrabocha Kerwasburschen! In the morning, the Fosalegn will run around in the village. In the afternoon, the second carneval parade of BGV Ehrabocha Kerwasburschen is taking place. On Friday 4th February at 19.00 our general annual meeting 2011 will take place in guesthouse Sponsel. The parish fair 2010 pictures are online in the internal area of the gallery now. Parish Fair 2010 is coming - all events, appointments and the t-shirt rules are available in the menu item dates now! In the gallery I have uploaded 123 new pictures from the annual party and the championships 2010. Under Association > Club Championship you can also find the results of the championships now! Congratulations to the winner Uwe Hübschmann! On Wednesday 18th August at 19.00 the last parish fair meeting will take place in guesthouse zur Sonne (Dennerschwarz). We would like to invite all members of our association to our traditional association party on 21.8. The new question of the competition is online now and can be answered until 14.8. On 22nd July there will be the next meeting of parish fair boys at 19.00 at guesthouse Sponsel. The pictures of the tournament are only since Monday evening. On 17th July beginning at 11.30 our beach volleyball tournament will take place again. BGV Ehrabocha Kerwasburschen has won a game with no limits of the school sponsorship association and has reached a good 2nd rank at the football tournament for associations of TSV Kirchehrenbach. On 24th June there will be the first meeting of parish fair boys at 19.00 at guesthouse Dennerschwarz. Under http://www.ehrabocha-kerwasburschen.de/Dienstplan_BeachVolleyball.pdf you can find the current work plan - please contact us to subsribe for supporting us! We need all help we can get! This years club trip will lead us to Aufseß, and we will also walk to three other breweries. From now on, it is possible to sign in for the trip by contacting Andy Schnitzerlein! Thanks a lot to all participants of the carnival parade 2010 and to all organisators, which made the parade a complete success! First pictures are online now in the gallery! On 15.2. at 15.00 hours, the carnival parade will start at the railway station! On Friday the 5th February 2010 at 19.30 the General Annual Meeting of BGV Ehrabocha Kerwasburschen will take place in guesthouse "zur Sonne" (Dennerschwarz) in Kirchehrenbach. All members and supporters of our association are kindly invited to this important General Annual Meeting with elections. The snow is still falling, and on 16.1. we will have the 2nd slide race in Kirchehrenbach! At 16.00 there will be the kids race for children up to 16 years. At 19.00, the race for the adults will take place! In the section dates you can find the plan for the year 2010 now. The first important date in the new year is the general annual meeting with elections on 5th February at guesthouse zur Sonne. In the internal gallery, you will find 500 additional pictures of Parish Fair Sunday and Monday now! BGV Ehrabocha Kerwasburschen wishes all the members and friends of our assiciation a merry christmas and a happy new year. On Friday the 11th December at 19 hours, the first hot spiced wine market of BGV will take place in Kirchehrenbach. We would like to invite you to Christmans Table on 16.12. at 20.00 in guesthouse "Zur Sonne". In the parish fair 2009 gallery, there are more than 100 new pictures of parish fair saturday. In the internal area of the gallery, there are new parish fair pictures online. Currently the pictures of parish fair 2009 and the annual party 2009 are currently being updated. The Parish Fair 2009 has been nstarted today for the next 7 days. In the internal gallery you can find about 150 new pictures of the Beach Volleyball tournament 2009. On Monday the 24th of August at 19.00 hours there will be the last meeting of vthe parish fair boys in the guesthouse "zur Sonne" (Dennerschwarz). On 22.8. there will be again our internal annual club party at the THW training grounds. All members of our association are invited to this party! The party already starts at 16.00 - the club championships will start at 16.30 Uhr! The pictures of the Beach Volleyball Tournament 2009 are online now. As always, the internal area contains even more pictures. In the name of the managing board I would like to thank all persons who helped that our Beach Volleyball Tournament 2009 was a success again. Thank you all! On Wednesday the 15th July at 19 hours, the next meeting of the parish fair boys takes place in guesthouse Sponsel. Under http://www.ehrabocha-kerwasburschen.de/Dienstplan_BeachVolleyball.pdf you can find the work plan for the Beach Volleyball tournament on 18.7.2009. If you want to help our association with this event, you can take a look into this work plan and send an email under Contact so that we can enter this into the plan. Thanks a lot in advance to all helpers! Under http://www.ehrabocha-kerwasburschen.de/BeachVolleyball.pdf you can also find the time table for the tournament now. Thanks a lot in advance to all helpers! The association BGV Ehrabocha Kerwasburschen has a new division for the organisation of the carnival tradirtions since May 2009. The division Fasching will be managed by Heiko Och and Tobias Roppelt. The managing board wishes the new division leaders a lot of fun, luck and success for their new tasks. We would like to invite all members of our association to an important meeting on 27th May (19.oo hours) to the guesthouse zur Sonne (Dennerschwarz). 103 pictures of the club trip 2009 have been uploaded into the internal area of the gallery. The association trip on 18.4. will start at 12.45 at the village center! In the internal area of the gallery there are 71 pictures of the Fosalegn. Also in the press area there has been an update with lots of press articles from the last year. From now on you can register for the association trip on 18.4. - please contact Uwe Hübschmann. On 7.3., the internet competition 2009 will start. As in the year before, every two weeks there will be a new question. On 13.2.2009, we would like to invite all members of our association to our general annual meeting 2009 into guesthouse Sponsel (begin: 19.00). A detailed overview of the agenda you can find in the German version of the news. In the internal area of the galery you can find 83 pictures of the slide race on 9th January now. On Fridday the 9th January at 19.00 is the start for the 1st sledge race of BGV Ehrabocha Kerwasburschen at the coasting slide in Öberköhr. The monthly regular table on 7.1.2009 will not take place due to holidays. But on 6th January there is a new year drink at guesthouse Sponsel (at about 20.00). The date for the general annual meeting 2009 has to be changed to 13th February. On Friday the 13.2. at 19 hours the general annual meeting will take place in guesthouse Sponsel. The winter hiking which had been planned for 13.2. will take place on 20.2. now! On Wednesday the 17th December at 19.00 we will have our regular christmas table and a very important full meeting of all members of our assotiation at the guesthouse Sponsel. In the menu item dates you can find the official schedule for the year 2009! On Saturday the 25th October at 1 p.m. we would like to invite you to a work service at Erlis barn. From Friday the 28.11. until Friday the 30.11. there are 4 free seats to Ischgl to the Ski Opening 2008! In the member area of the gallary, 332 pictures of parish fair 2008 are online now! The pictures of the annual party 2008 are online now in the internal gallery. On 26.8. there is a last and important meeting of division parish fair. We meet on Tuesday the 26.8. at 19.00 at the Lindenkeller. On Friday the 15th of August at 18 hours, all members of our association are invited to our summer hiking 2008. On Saturday the 23th of August we kindly invite all members of our association to our club party with club championships to the THW training ground in Kirchehrenbach. The party will start at 16 hours. At 16.30 we will once again start our intersting club championships. 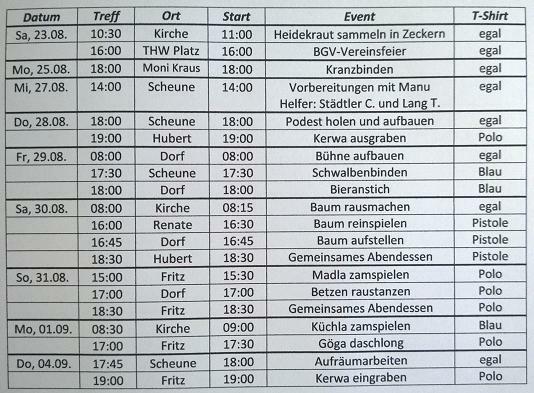 On 25.7. at 19 hours there is a meeting of all active parish fair boys in the guesthouse "zur Sonne" (Dennerschwarz). The service schedule for the Beach Volleyball Tournament on 10th July can be donwloaded HERE. There are still services needed - therefore we ask all members which have not subscribed for a service yet to contact chairman Thomas Gengler if they would like to choose a service. Thanks a lot in advance! On this homepage Questionnaire about the regular table now. All members of our association are asked to participate this questionnaire. On 11th June there at 19.00 hours there will be an important association meeting in guesthouse Sponsel with the topics parish fair 2008 and beach volleyball tournament 2008. Our association BGV Ehrabocha Kerwasburschen has an own logo now. For the creation of our logo we would like to thank our designer Nina Scholz. In the gallery (Member Area!) there are 200 new pictures of the club trip 2008! Sign up for the association trip 2008 on 12.4. now! Please swith to German language in order to view the detailed program of the trip! The music program for Parish Fair 2008 is fixed now. The internet competition of our association has started today! From 2nd February until 6th December there will be a new question every two weeks. Changes in the charter: The changes in the charter are available in German language only! From 2nd February until 6th December 2008 there will be a new question about our association every two weeks. All members of the association can participate this competition using the menu item competition. Under the menu item press you can find 5 new newspaper articles about our association. On Friday the 25.1.2008 at 7 p.m. there is the general annual meeting 2008 (incliding elections of the managing board) in the guesthouse "zur Sonne / Dennerschwarz". All members are kindly invited to this general annual meeting. The detailled agenda is available in German language only. BGV Ehrabocha Kerwasburschen wishes you all a merry christmas and a happy new year! The first event planning for the year 2008 is finished now. Details and further dates you can find using the menu item dates. In the member area you can find 650 pictures of parish fair 2007 now! With digging out the parish fair, the parish fair 2007 has started officially yesterday evening. 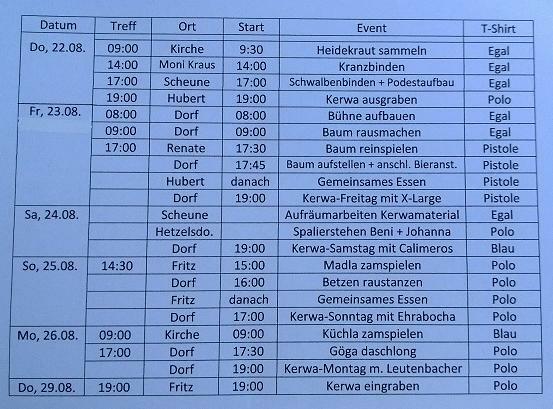 During this week, the Kerwasburschen will have a lot to do celebrating many parish fair traditions. Further information you can find in the navigation menu items division parish fair and dates. In the navigation menu item press there are many new press articles now. There are for example reports about parish fair 2007, the beach volleyball tournament, the club championships 2007 and the annual general meeting 2007. The pictures of the annual party 2007 and of the club championships are online now. The results of the club championships can also be looked up in the menu item association. On 18th August there is the Annual Internal Party with Club Championships at THW training space in Kirchehrenbach! All members of our assotiation are invited to this party. Drinks and food are gratis! The party starts at 18.30. After sipper the club championships 2007 will start! We kindly ask all members to bring plates and cutlery with them! The todos and dates for the parish fair 2007 have been updated. You can find the todo-list HERE. On 9.8. at 7 p.m. there will be dancing lessons in the clubhouse of TSV Kirchehrenbach for all Betzn dancers of parish fair 2007. We ask all dancers to inform their girls and to bring them with them on 9.8. On 8th of August at 7.30 p.m. there is the last meeting of all active members before the parish fair 2007 in the guesthouse Sponsel. We ask all active members to participate this important meeting! Under Gallery you can now find also in the public area 149 pictures of our Beach Volleyball Tournament on 14.7.! At the football tournament of the associations in Kirchehrenbach on 8.8.2007 , the team of BGV Ehrabocha Kerwasburschen reached a good 7th rank (12 participants). In comparison to the previous year, our team showed a much better football! The managing board of BGV Ehrabocha Kerwasburschen would like to thank all the helpers, which helped our association so that our beach volleyball tournament on 14.7. could be successful. In the internal area you can find 384 pictures of the event now! On 14.7. the beach volleyball tournament of our association will take place. On 1. July at 7 p.m. there is a meetings of all members of our association in the guesthouse Dennerschwarz. Our association will attend the football tournament of the associations of Kirchehrenbach. Our players meet at 10.30 a.m. at the sports field of TSV Kirchehrenbach. On 22th June BGV Ehrabocha Kerwasburschen organizes a concert with the band "Nimm 2" in the clubhouse of the shooting club in Kirchehrenbach. BGV Ehrabocha Kerwasburschen still needs some helpfers for the beach volleyball tournament on 14th July. Interested members can contact our first chairman Thomas Gengler. On Thursday the 31. May at 19.00 hours we have our first meeting of all active "Kerwasburschen" in the guesthouse Sponsel. Thomas Gengler, leader of the division "Kerwa", kindly asks all active "Kerwasburschen" and all new interested persons to participate this important meeting. Please also tell this date to all other active "Kerwasburschen"! Yesterday, our new association marquee(12 x 6 meters) has been built up for testing purposes. Thanks to all helpers, which have bulit up and dismantled the association marquee for the first time. You can find a few pictures of the marquee in the picture gallery. Additional pictures of the building up have been uploaded into the picture gallery of the internal area. Today the association "Ehrabocha Kerwasburschen" has applied for the Kulmbacher competition "Wer hat Kerwa?" 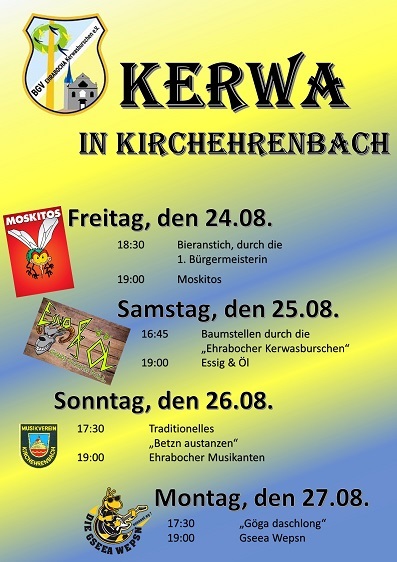 In this competition, 25 groups of"Kerwasburschen" have the opportunity to win a Kulmbacher parish fair set. The association "Ehrabocha Kerwasburschen" has applied for this campaign and has therefore sent pictures of our traditions digging out the parish fair, setting the parish fair tree, "Betzn austanzen" and "Göga daschlong". You can find details about this competition by using the following link: www.wer-hat-kerwa.de. In the internal area you can find 23 pictures of the annual general meeting on 2.2.2007 now. Furthermore, 61 pictures of the winter hike on 9.2.2007 have been uploaded into the gellery of the internal area. On 2.2.2007, the association "BGV Ehrabocha Kerwasburschen" had its first annual general meeting. On 8.1., the standing orders of the managing board have been changed. In the gellery, the pictures by Thomas Dauer and Marco Baumann have been added, too. Now, 274 pictures of the silvester party in the Friday are online in the gallery. The association "Brauchtums- und Geselligkeitsverein Ehrabocha Kerwasburschen" wishes all members a merry christmas and a happy new year! You can find the pictures of the christmas regular table 2006 in the gallery now. I hope you liked the christmas regular table and that a lot of members will also participate the monthly regular tables in 2007. The homepage of BGV Ehrabocha Kerwasburschen is available in two languages now. From now on, the webpage is available both in German and in Engslish language. At 20.12. the christmas regular table will take place in the guesthouse Gasthaus Sponsel in Kirchehrenbach. All active and passive members are invited to participate this regular table. From 2007 the regular table will take place every first wednesday of a month. The exact dates can be viewed on this homepage and in the newsletter of the commune Kirchehrenbach. The events for the year 2007have been published today. The first important date is our annual general meeting at 2.2.2007 in the guesthouse "Gasthaus Sponsel". All members and friends of the association "Brauchtums- und Geselligkeitsvereins Ehrabocha Kerwasburschen" are invited. The next highlight will take place at 14th July. At the "Wiesentmühle" we will organise a beach volleyball tournament with other associations and "Kerwasburschen" from surrounding villages. Because our foundation party with club championships was a great success in the year 2006, we would like to organise another internal party again one week before the parish fair 2007 begins. The exact date is the 18th August. From 23.8. to 30.8. we will maintain the local traditions. 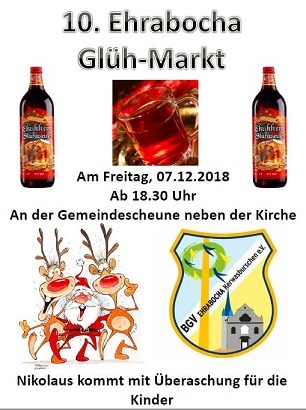 Then, the parish fair in Kirchehrenbach will take place, and the "Kerwasburschen" will perform traditions like setting up the parish fair tree, "Gögs daschlong", "Betzn austanzen" or "Küchla zamspieln". The events of the year 2007 will end with a christmas regular table at 19th December in the guesthouse "Gasthaus zur Sonne".